Deep crimson (H13) flowers; VIII–IX; foliage very dark green; habit broad spreading, upright; height 26–30cm; spread 46–60cm. A very hardy seedling, raised by Brita Johansson: it survived the disastrous winter in Sweden in 1995–1996). Named after the Greek earth godess and the first mother of all the Greek gods. Registered 13 January 2000; Brita Johansson, Musselvagen 3, 468 34, Vargon, Sweden. ♤ White buds, VIII–IX; yellow-gold foliage; tidy, compact, upright. Better than most other gold-foliaged white-budded clones; of Canadian origin. Selected from trials at Wilson's Nursery, Chilliwack, British Columbia, Canada, in October 2004 by David Wilson. ® C05:2004 registered November 2004 by David Wilson, Chilliwack, British Columbia, Canada. Sparse mauve (H2) flowers, VIII–IX; bronze-gold foliage in summer, deepening to salmon-red in winter, becoming pale green in spring with red-brown new shoots; prostrate; height 10–15cm; spread 31–45cm. Named after the finder's wife. ♤ Bud-flowering (Knospenblüher) H7 (rose-pink); buds 5mm long, to 2mm diameter; VIII-XII; foliage light green; habit upright; height 30cm; spread 25cm after 3 years (pruned). Bud colour between ‘Pink Alicia’ and ‘Rosita’. Sport on ‘Pink Alicia’ found by Kay Müssig, Miltenberg, in autumn 2003. ® C.2012:02 registered on 19 February 2012 by K. Kramer, Edewecht-Süddorf, Germany. ♤ Lilac-pink (H11) buds, VIII–XI; dark green foliage; height 31–45cm; spread 31–45cm. Wild-collected; found on the Ginkelse Heide near Arnhem, Netherlands by Dr Ir T. Visser (Wageningen, Netherlands) before 1972; introduced by W. Haalboom & Zonen (Driebergen, Netherlands). Named after the locality where it was collected. There is an apostrophe in the first word. White flowers, VIII–IX, in dense spikes; silver-grey foliage; more upright, and suffers less winter damage than 'Beoley Silver' from which it was a sport; height 31–45cm; spread 46–60cm. Magenta (H14) flowers, IX–XI; dark green foliage; broad erect habit; height 30cm; spread 40cm. A multibracteate clone with malformed flowers. Seedling between 'Battle of Arnhem' and 'Allegro' (K. Kramer, c.1987); selected by Jos Flecken. ® C.2007.03 registered 15 October 2007 by Jos Flecken, Kerkrade, Holland. White flowers, VIII–IX; mid-green foliage; open spreading habit; height 16–20cm; spread 31–45cm. Named after a whisky distillery in Scotland. ❁ Shell-pink (H16) flowers, VIII–X; dark green foliage, acquiring tints of bronze in winter; height 31–45cm; spread 61–75cm. Wild-collected; found in Argyll, Scotland, by 'a lady from Wentworth' before 1964; introduced by J. F. Letts (Westwood Road, Windlesham, Surrey, England) in 1969. Named after a pass in Argyll, Scotland. Pale lavender (H3) flowers in long spikes, VIII–IX; silver-grey, velvety foliage; semi-prostrate; height 16–20cm; spread 31–45cm. Seedling; found by P. A. Cox (Glendoick, Perth, Scotland) about 1971; introduced by P. A. Cox by 1975. Named after a nursery near Perth, Scotland and the foliage colour. Mauve (H2) flowers, VIII–IX; feathery foliage similar to 'Cuprea' but more striking in winter; height 26–30cm; spread 31–45cm. Recommended. Wild-collected; found in Glenogle, Perthshire, Scotland, by D. Hutton in 1962; introduced by D. Hutton (Aberfoyle, near Callander, Perthshire, Scotland) by 1973. Named after a single malt whisky. Pink (H8) flowers, VIII–IX; orange foliage turning a striking deep red in winter; spreading; height 10–15cm; spread 21–25cm. Wild-collected; found in the hills above Aberfoyle, Perthshire, Scotland, by D. Hutton in 1962; introduced by D. Hutton (Aberfoyle, near Callander, Perthshire, Scotland) in 1973. Pale lavender (H3) flowers, VIII–IX; deep orange foliage in summer, turning red in winter; when young the shoots swirl, so the plant is dwarf and compact habit; height less than 10cm; spread 16–20cm. Found in Glen Sligachan (Isle of Skye, Scotland) in 1962 and named after a malt whisky. Flowers pale amethyst (H1) shading to pink (H8) at the base, VIII–IX, in long spikes; dark green foliage, tipped magenta in autumn; vigorous, upright; height 46–60cm; spread 75–100cm. A sport on 'Robert Chapman', found by Lindsay Campbell (Argyll, Scotland) and named after Gloucester Boy, his pet rat which had just died. Registered 12 November 1998: L. Campbell, Merle, Kilmore, by Oban, Argyll, PA34 4XX, Scotland. Mauve (H2) flowers, IX–X; dark green foliage; compact, upright; height 21–25cm; spread 31–45cm. Sport from 'Gnome' and it may revert to it. Found at Beechwood Nursery (Beoley, Redditch, Worcestershire, England) and introduced by J. W. Sparkes by 1964. White flower, shy bloomer; foliage dark green with lighter green tips; height 20cm; spread 35cm. So named because of its habit. Violet flowers, VIII–IX; gold foliage, the young shoots tipped pink in spring; compact; height 16–20cm; spread 31–45cm. Magenta (H14) flowers, VIII–IX; gold foliage, darkening in winter; compact bushy habit; height 26–30cm; spread 31–45cm. Introduced by Ray Warner (Barncroft Nursery, Longsdon, Staffordshire, England) before 1985. The name of a small bird, but here alluding to the foliage colour. Beetroot (H9) flowers, VIII–IX; yellow-gold foliage shaded orange in summer, which intensifies during autumn and winter to bright red; height 26–30cm; spread 31–45cm. 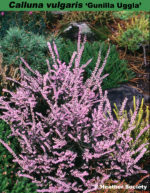 Similar to Calluna vulgaris 'Sir John Charrington' but produces slightly paler flowers a little earlier. Found by Brian & Valerie Proudley; introduced by Proudleys Landscape Gardeners (Two Bridges, Blakeney, Gloucestershire, England) in 1969. White flowers, VIII–X; pale yellow foliage throughout year; upright; height 26–30cm; spread 31–45cm. 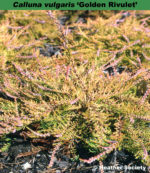 Another good heather introduced by J. W. Sparkes which won a Silver Medal at Boskoop, Netherlands in 1967. Sport on 'Hayesensis'; found in 1959 by J. W. Sparkes (Beechwood Nursery, Beoley, Redditch, Worcestershire, England); introduced by J. W. Sparkes in 1961. Lavender (H3) flowers, VIII–IX; downy, gold foliage; vigorous, erect; height 31–45cm; spread 46–60cm. 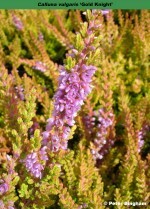 Lavender (H3) flowers, VIII–IX; orange foliage in summer, turning salmon-pink in autumn with dull rust tips in winter; slow-growing; height 10–15cm; spread 10–15cm. Found by John Letts in 1970; introduced by Foxhollow Heathers (St Briavels, Gloucestershire, England) in 1972. White flowers, VIII–IX; green-gold foliage; compact, erect; height 26–30cm; spread 31–45cm. Raised and introduced by C. Benson (Preston, Lancashire, England) before 1987. White flowers, VIII–IX; clear yellow foliage throughout the year; upright; height 31–45cm; spread 46–60cm. Found by H. Hoekert (Oldebroek, Netherlands); introduced by Hoekert in 1983. The unusual name derives from an area near Oldebroek in the Netherlands. White flowers, VIII–IX; light golden foliage; height 46–60cm; spread 46–60cm. Sport on 'Loch Turret'; found by R. J. Brien (Pitcairngreen Heather Farm, Perth, Scotland); introduced by A. C. Smith (Lochearnhead, Perthshire, Scotland) in 1972. Name alludes to the parent plant and the foliage colour. Lilac-pink (H11) flowers, VIII–IX; gold foliage, deepening in winter; height 26–30cm; spread 46–60cm. ♤ Bud-flowering: red ("mittelrot"): IX-XII. Foliage golden yellow. Habit bushy, upright. to 50cm tall, 50cm broad in 5 years. Sport on 'Moulin Rouge' found at Gerldern by Johannes van Leuven in September 2008. ® C.2010:07 registered by Johannes van Leuven, Geldern, Germany. Lilac flowers, VIII–IX; intense golden yellow foliage throughout the year; open erect habit; height 31–45cm; spread 46–60cm. A sport found on 'Blazeaway' by John L. Jones, Glynwern Nursery, Cilcennin, Lampeter, Dyfed, Wales; introduced in 1994. Differs from its parent in keeping its intense gold foliage in winter, making a very nice plant. Mauve (H2) flowers, IX–X; gold foliage turning orange and red in winter; prostrate; height 10–15cm; spread 26–30cm. Seedling amongst a group of 'Mrs Ronald Gray'; found by John F. Letts (Foxhollow, Windlesham, Surrey, England); introduced by John F. Letts in 1966. Name is an allusion to the foliage colour and habit. White flowers, IX–X; gold foliage; low, open habit; height 10–15cm; spread 31–45cm. ❁ White flowers, VIII–IX; light golden foliage throughout the year; erect; height 26–30cm; spread 46–60cm. Sport on 'My Dream'; found by G. J. Cookes at Little Froome Nurseries (Fenny Drayton, Warwickshire, England) in 1984; introduced by Little Froome Nurseries in 1986. ♤ Bud-bloomer, calyx lilac-red;IX-X; foliage outstanding yellow in summer turning orange in winter; habit broad, spreading. Sport on 'Marleen'; found by Eckart Berndt in his nursery in 1998. Named after Eckart Berndt's daughter, and alluding to the foliage colour. Registered on 6 October 2002 by Eckart Berndt. Mauve (H2) flowers, VIII–X, sparse; feather-like gold foliage in summer, turning reddish orange in winter; height 21–25cm; spread 61–75cm. Very susceptible to windburn. Lilac (H4) flowers, VIII–IX, sparse; yellow foliage in summer, turning bronze in winter; compact, bun-shaped habit with curling stems; height 10–15cm; spread 21–25cm. Seedling; found by David Edge at Forest Edge Nurseries (Woodlands, Wimborne, Dorset, England) in 1985; introduced by David Edge by 1988. Named for foliage texture and colour. 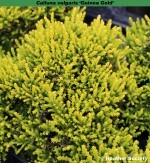 Golden foliage; forms diminutive, compact, dense mound; height 6–7cm; spread 10cm. Of Swedish origin, this plant has never bloomed. Chance seedling, in garden of Gunnar Kry, Rydal, Sweden; named by Gunnar Kry. White flowers, VII–VIII; clear yellow foliage throughout the year; upright; height 31–45cm; spread 46–60cm. Named after Jan Dekker's dog! Mauve (H2) flowers, VIII–IX; yellow-gold foliage in summer, turning orange in winter; prostrate when young but develops a semi-prostrate habit; height 16–20cm; spread 26–30cm. It does not suffer as much from scorch as other orange-foliage lings. Found by P. G. Davis (Haslemere, Surrey, England); introduced by P. G. Davis by 1968. Yates described it as an introduction from Holland. Flowers mauve; VIII-IX; foliage deeper gold than 'Sunrise'; habit compact. A sport from 'Sunrise' found on his nursery by John L. Jones, Glywern Nursery, Cilcennin. Lampeter, Dyfed, Wales by 1992. Flowers none to date; foliage gold in summer, lime-green to gold in winter; habit compact, erect, low. A chance seedling found in 1996 and named to celebrate Jack and Ruth Piatt's golden wedding anniversary in 1999. Registered 1 November 1999: Jack Piatt, Fernbank, 176 Southport Road, Ulnes- Walton, PR5 3LN, Lancashire, England. ♤ Bud-flowering, white; IX-XII; foliage golden; habit bushy, upright; height 50cm; spread 50cm after 5 years. ® C.2011:10 registered on 25 November 2011 by J. van Leuven, Geldern-Lüllingen, Germany. ❁ Lavender (H3) flowers, IX–X; dull yellow-green, velvety foliage; an erect bushy plant; height 31–45cm; spread 46–60cm. Found in 1985 . It was introduced in 1989 and was formerly known as Gold Star. Crimson (H13) flowers, IX–XI, in long spikes but not free-flowering; very dark green foliage; height 31–45cm; spread 31–45cm. Named after the nursery which introduced it. Ruby (H5) flowers, IX–XI, sparse; dark green foliage flecked with red and orange; upright; height 31–45cm; spread 31–45cm. Found by W. C. Slocock (Goldsworth Nursery, Woking, Surrey, England); introduced by W. C. Slocock before 1964 as 'Goldsworth Crimson Variegata'. 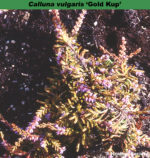 Name alludes to the parent plant and the foliage colour. The three words are separate and there are no hyphens. Wine-red flowers, VIII–IX; gold foliage in summer turning orange-red in winter; open erect habit; height 46–60cm; spread 61–75cm. Named after the nursery which introduced it. Pink (H8) flowers in pretty, long spikes, VIII–IX; dark green foliage; upright; height 26–30cm; spread 31–45cm. Found by Robert Hayes (Grasmere, Cumbria, England), and introduced by Robert Hayes in 1930; resembled 'Hammondii'. Named after Grasmere, a lake in the English Lake District. Mauve (H2) flowers, IX–X; dark green foliage; spreading; height 21–25cm; spread 31–45cm. Named after the garden near Sevenoaks, Kent, where it was found. Lilac-pink (H11) flowers, VII–VIII; bright green foliage turning maroon in winter; stiff upright habit; height 31–45cm; spread 31–45cm. Flowers lavender, VIII-IX; bright golden yellow foliage with red stems, acquiring more red in winter; height 12-16 cms, spread 25-40 cms. Mauve (H2) flowers, VIII–IX; downy silver-grey foliage; prostrate; height 10–15cm; spread 31–45cm. Found by a past President of The Heather Society, David McClintock, in his garden at Platt, Kent. Mauve (H2) flowers, IX–X; downy grey-green foliage; neat erect habit; height 16–20cm; spread 31–45cm. Lavender (H3) flowers, VIII–IX; pale grey foliage, more silvery than its parent 'Silver Knight'; strong, upright grower; height 31–45cm; spread 46–60cm. Found at Tornesch-Ahrenslohe, Germany, as a sport. Lilac-pink (H11) flowers, IX–X, in long spikes; downy grey foliage; vigorous, upright; height 61–75cm; spread 61–75cm. Mauve flowers, but very sparse; yellow-green foliage; forms a diminutive, pin-cushion; height less than 10cm; spread 10–15cm. Very hardy. Wild-collected; found at Grönsinka, Dalarna, Sweden, by Ellert Björklund in 1983; introduced by Arthur Persson (Tostarp, Sweden) in 1991. ♤ Bud-flowering, pink (“Light Pink” H7–H8); IX-XI; foliage green; habit upright; height 60cm; spread 50cm after 5 years. ® C.2011:11 registered on 25 November 2011 by J. van Leuven, Geldern-Lüllingen, Germany. White flowers, IX–X; yellow foliage throughout year; vigorous; height 31–45cm; spread 46–60cm. ❁ Pink (H8) flowers, deeper in colour at base; IX–XI; some flowers shaded salmon; foliage dark greyish; habit open, spreading. Does not respond well to being pruned. Wild-collected; found by Gunilla Uggla in a forest in Smaland, southeast Sweden, in August 1987. Registered 13 January 2000; Brita Johansson, Musselvagen 3, 468 34, Vargon, Sweden.